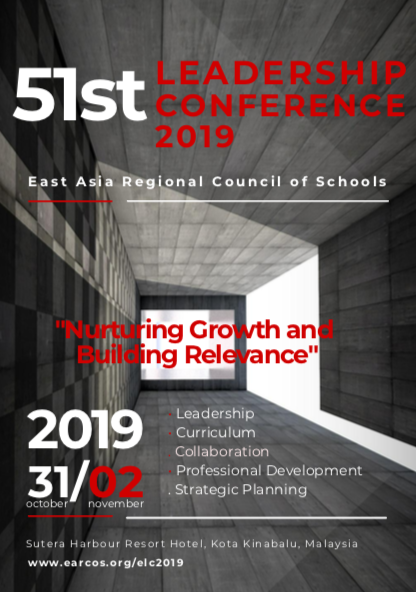 The East Asia Regional Council of Schools is excited to invite you and your administrative staff as delegates at the 51st Annual EARCOS Leadership Conference (ELC2019) in Kota Kinabalu, Sabah, Malaysia scheduled for October 31 to November 2, 2019. We have a host of excellent keynote speakers and workshop presenters. Please navigate through our website to view the list of speakers and their presentation topics along with titles and descriptions. This will be updated weekly to maintain the most current information about the presentations. Please use the menu bar above and side bar for additional information on the conference. We think the conference will prove to be professionally stimulating and will provide you with an opportunity for networking and building camaraderie. Thank you to Malaysia Convention & Exhibition Bureau for their generous support of this year's EARCOS Leadership Conference 2019.